So when this year’s retreat came along, I decided to tackle this project. At least I would have some people by my side to „hold my hand“ and push me through. Sadly I forgot the zipper pulls, so I had to stop at the point where they are supposed to go on. I finally picked it up this week and I am happy with my first try. It is mostly perfect with a few… let’s not talk about the small imperfections, right?! I think it turned out pretty well. 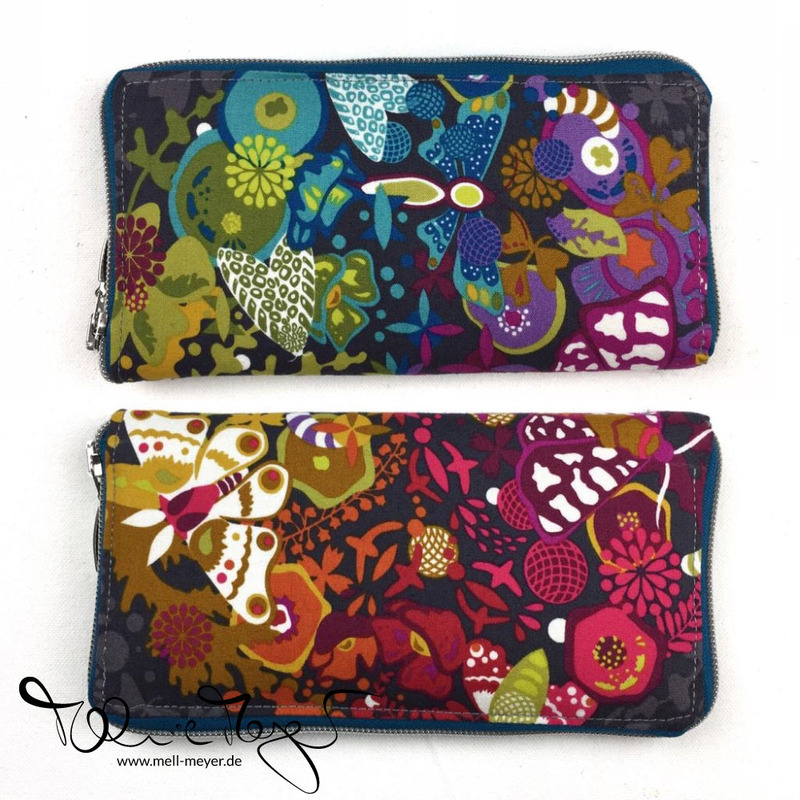 I love the Alison Glass print for the outside and the two others on the dividers. 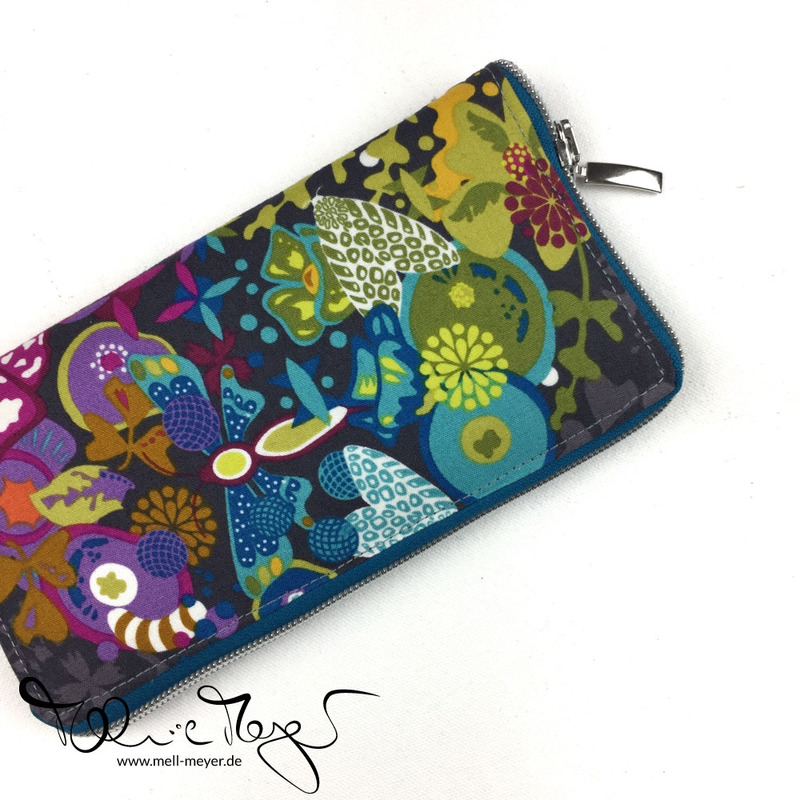 If you are interested in sewing your own, you can find the pattern here. It is in German; no idea if it was ever translated to English. This is beautiful!!! I think you did an amazing job on it and I hope it makes you smile every time you pull it out! Congratulations on another finish!!! It looks great! I am really scared of „3D projects“, they always take me longer than expected -and those zippers!!!-. 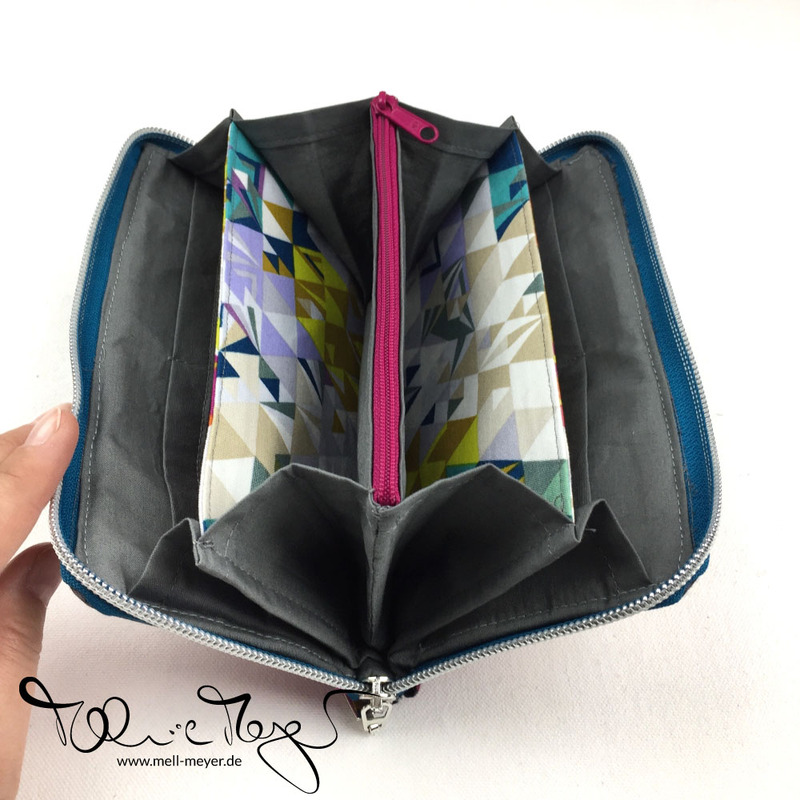 The „Sew together bag“ is on my WIP list, and I do not foresee tackling it on the short term, and this would be the closest to a wallet I would have ever sewn. 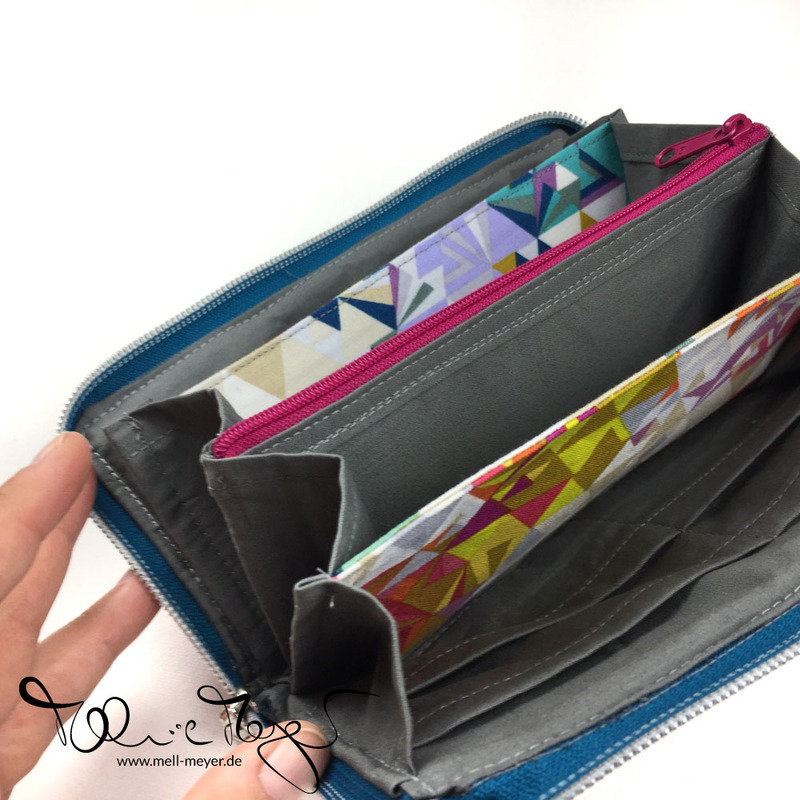 (I have sewn several bags, but I think it’s the small size of wallets which scares me the most… and working with metal zippers). Half-finished or half-started? It is like the glass is half-full or half-empty, isn’t it? But in the end you finished it completely and it looks fabulous. I have never used a metal zipper and I am scared. What if the needle hits the zipper? I find bindings to be exciting because I know that the project is almost finished. I had to hand bind the Colorwash quilt and that took much longer than machine binding. I am working on a blue-green star quilt for my brother. Must finish before I leave for India in two weeks. YIKES!!! I love love love your wallet. Well this turned out beautifully! Congrats on making your list and checking it twice! 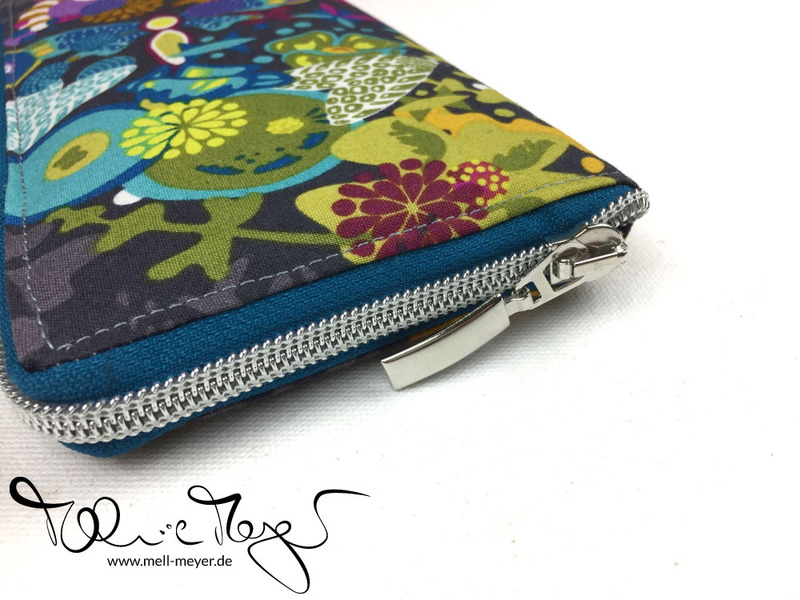 Zippers aren’t as bad as their reputation ; ) The AG fabric is perfect for the outside and the two inner fabrics are the icing on the cake. One more thing under your belt! I love this, shame I’ve not spoken a word of German for 17 years because this is a lovely pattern! Maybe this is a good excuse to try again. What a great wallet. I can understand your hesitation, but I’m glad you persisted and finished it! Thank you for participating in the FAL, on behalf of the 2018 hosts!